Today, all we have showing us that the Paleo-Hebrew used freestanding Aleph/Tav את Symbols thousands of years ago, is the language which has survived because it was carved on a hard surface such as stone. One such example is the Jehoash Stone (pictured below), which is 12 x 24 x 3 inches (30 x 61 x 8 cm) in size, supposedly found on an archeological dig near the temple mount in Jerusalem in 2001. Carbon-14 dating by Israel’s Geological Institute, under Shimon Ilani, has authenticated the inscription as being at least 2,300 years old and helps to authenticate the timing of the inscription describing repairs to Solomon’s Temple as ordered by Solomon’s descendant, King Joash (Jehoash) of Judah in the 9th century B.C. This is also in line with the Biblical text of 2-Kings 12:1-6 and 11-17. Starting from the top, line 2 actually has a Paleo-Hebrew Aleph/Tav between the words “collect” את “silver”, corresponding with the fact many times when the Tanakh speaks of temple money, we see an את before silver or gold. 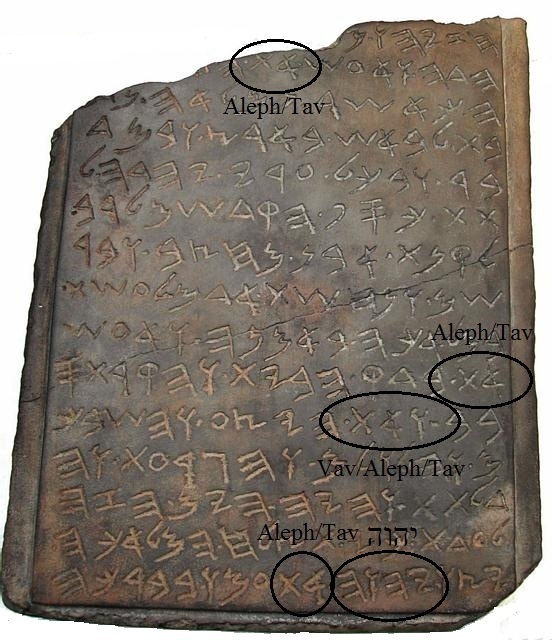 Also in the beginning of line 10 on the stone, a Paleo-Hebrew Aleph/Tav is before the words “breaches to the temple walls”, which corresponds with 2 Kings 12:5. Throughout the Tanakh we see Aleph/Tavs in front of the word temple and also when speaking of the temple walls or furnishings. Line 11 has a Vav/Aleph/Tav ואת Symbol in front of the Paleo-Hebrew word “storied structure” in regard to the multi levels. Vowels were not added to Babylonian-Hebrew letters until sometime between the 8th and 10th Century A.D. by the Masoretes. Even the Dead Sea Scrolls (pictured below), which were written approximately 2000 years ago primarily in Babylonian-Hebrew have NO vowel points associated with the Hebrew letters. Some of these scrolls can be viewed on line at http://dss.collections.imj.org.il where you will clearly see both the Aleph/Tav את Symbols and the Vav/Aleph/Tav ואת Symbols, as well as יהוה Tetragram on the scrolls. For thousands of years there has always been only one Hebrew language but it has two different scripts. The exact date is unknown, but it is believed that around 597 B.C. the Scribes began translating all the Paleo-Hebrew scrolls into Babylonian-Hebrew and the language was replaced gradually over time. Credit is given to Ezra the scribe, whom refined the letters while in exile in Babylon. Thus, is the origin for its name, Babylonian-Hebrew. Unfortunately there are no Paleo-Hebrew scrolls in existence today. It is believed that all the old scrolls disintegrated before Y’shua the Messiah was born.